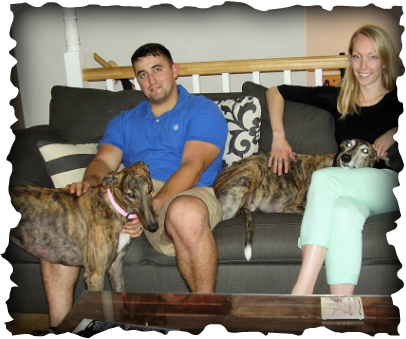 Lauren and Ryan of Fairborn join the ranks of those of us who have been unable to let our foster dog go. RP Raggin Lizzy, now called Piper (in the pink collar), is an active little girl who nicely matches the energy level of greyhound Joey (when he's not lounging on the couch). Piper started off wanting to be Queen but now is settling in well and learning to play nice. She wasn't much of a racer but she's going to make a terrific family member.